Academic essay writing is one style that anybody can learn to produce if they are understanding rudiments of writing an essay. When you write an academic essay, you should provide a solid debatable thesis that is supported by relevant evidence. This evidence can come from the writer’s research as well as other sources. Academic essays follow a predefined set of guidelines. 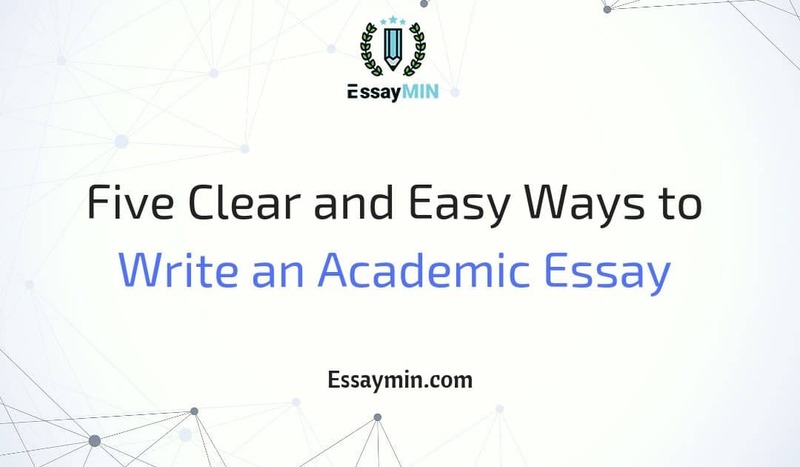 If you are able to remember, the basic principle if academic writing, then you will be able to create a valuable, persuasive academic essay regardless of the time constraints. The ability to write a strong academic essay is important for a college student. This skill whose applicability remains relevant, especially if one decides to delve into fields that involve persuasive or analytical writing. To write an effective academic essay, you have to start by following the instructions provided by the lecturer. Another important preliminary step is to research on the topic that you are dealing with in your paper. You will be able to get some of the best and reputable sources for your paper. Every preliminary step is important. What are the clear and easy ways you can invoke to write a competent and effective academic essay? Before you even start writing, you must know what you are going to say. The easiest way to narrow down your thesis and to formulate a proper argument is to create a simple outline before you start writing the essay. As it is conventionally known the basic structure of, an essay includes the introduction, which houses your thesis statement, the body of your essay, which comprises of several paragraphs and the conclusion that ties everything with the thesis statement. At least three points that align with your thesis should guide the amount of evidence that you present in your essay. When you are writing your introduction, ensure that it closes with your thesis statement. This provides the reader with an appropriate transition to the body of the essay; your introduction should hook the reader’s attention, just by virtue of being the first paragraph they read. The body of your essay should have several paragraphs that support the central arguments of your thesis. Every paragraph should discuss a single idea; which is supported by several sentences. The transitions between the paragraphs should show your thought progressions. It should guide the reader from one idea to the next without creating unnecessary interruptions of information. The conclusion of your essay should tie up everything with the thesis statement that you provided in the introduction. An important point to note is that conclusions do not allow the introduction of new evidence, facts if information. It should synthesize everything in light of the evidence you have presented in your essay. If you follow these simple steps, your essay will rise above the normal standards and earn you good grades. The advantages of using an outline include getting a rough sketch of how your essay will look like. It is a skeleton that you fill with details to make the essay one concrete argument. An outline also enables you to write down every information that you have on your mind. You are able to know where to fit certain details that support your argument. Every writer must make use of an outline if they want to improve their writing skills. Grammar, style, and punctuations are essentials of writing a good essay. You must have a good grasp of them if you want your essay to be well understood. Basic grammar is incredibly important, and you should ensure you have it. You ought to know the basics of grammar that include subject and verb agreement, proper articles, and pronouns usage as well as excellent sentence structure. Punctuation is another aspect you have to know without a doubt. For instance, you should know that a comma is used to divide sentences into different parts. This improves the readability of your essay; it creates pauses and connects your thoughts on paper. Commas are used with conjunctions. When it comes to the use of a colon, they separate items in a list when one or more items have a comma. They join independent clauses and sentences. Hyphens are used to create a compound adjective especially when they precede a noun. Their usage is not as strict as other forms of punctuations. When you use apostrophes, you are simply denoting possessive nouns. Periods, commonly referred to as full stops are used to end sentences. When used in abbreviations, they are referred to as periods. You also need to be aware of homonyms because they are words that sound the same but have a different meaning. When writing an academic essay, beware of words like two, too, too, its, it’s, their, there, they’re, whether, weather and so on. They can confuse you and as such be sure to know their correct meaning and usage. Language use is very important in academic essay writing. Remember that you are trying to persuade others to believe in your argument. You are portraying yourself as the expert on that issue to the audience. As such, using big words to sound smart will give you the opposite effects. The audience is intelligent enough to detect when someone is overcompensating in their writing. If you are not sure of what a particular word means, you risk using it incorrectly. The clarity of your argument can also be interrupted by obscure language. You have to ascertain that the word you are using is consistent with what you want the audience to understand. An important factor to consider is that no writer is supposed to overestimate or underestimate the level of knowledge of the target audience. This will make one use the appropriate knowledge and avoid chances of making your argument to sound egotistical. When you are writing an academic essay, your major argument should always be in your mind. While it might sound interesting to digress a little bit and deal with an interesting side to your topic, you might lose the conciseness that your academic essay deserves. Question every evidence that you include in your essay to find out if it aligns with your thesis statement. If it does not support your thesis, the best thing to do would be to exclude it. In other papers, there is a room for the opposing opinion. However, the writer must poke holes on the opposing argument and show its inconsistency either with the topic or the existing knowledge. When it comes to your academic essay, everything you include must tie with your thesis statement. If there is an area that is overlooked in academics writing, then it must be the conclusion paragraph. This is what ties everything you have discussed together to prove your thesis. Your conclusion should restate your thesis statement. It outlines all the evidence discussed in your essay and shows how it supports or disagrees with your thesis statement. Many perfectly written essays have been derailed by vague and weakly worded conclusions. Note that when you are writing your conclusion; do not include any new evidence, facts, or information. If you do that your essay will not have the closure it needs. Your conclusion should give the readers an immediate impression of something that will last in their minds way after they are done reading it. The essence of your conclusion is to give your essay closure. It signals to the reader that you have finished your arguments. In some papers, the conclusion might include recommendations for further study on the topic. This is mostly done in major research papers and other related works. After the completion of the first draft of your essay, you can test your thinking against the available evidence. You can change the direction or your essay or modify the idea that you started with. Start at the top to ensure that the essay still gives a clear focus on the issue you are handing. If need be, sharpen the focus of your essay. You have to understand that clear and direct beginning does not necessarily present themselves as ready-made. They are written and re-written. This ensures that your essay gets the sharp clarity that you intended to engage the reader and establish your authority on the matter. These steps can greatly improve the way you write your academic essay. Every step is important, and it is crucial to keep writing until your skills are better. Writing in college is an everyday exercise, and however daunting it seems, you have the power to do it. It takes practice and some doses of help.